OtsAV Free is the free edition in the OtsAV professional suite of products which are designed for DJs, Radio and TV Stations, Solution Providers, Businesses and AV Enthusiasts. OtsAV Free is for personal use and private parties, or evaluating OtsAV for commercial purposes, and has almost all the same technology as the Pro edition. Automated beat-mixing and intelligent fade-mixing, coupled with a broadcast quality Dynamics Processor, provides you with high quality sound with a professional polish. 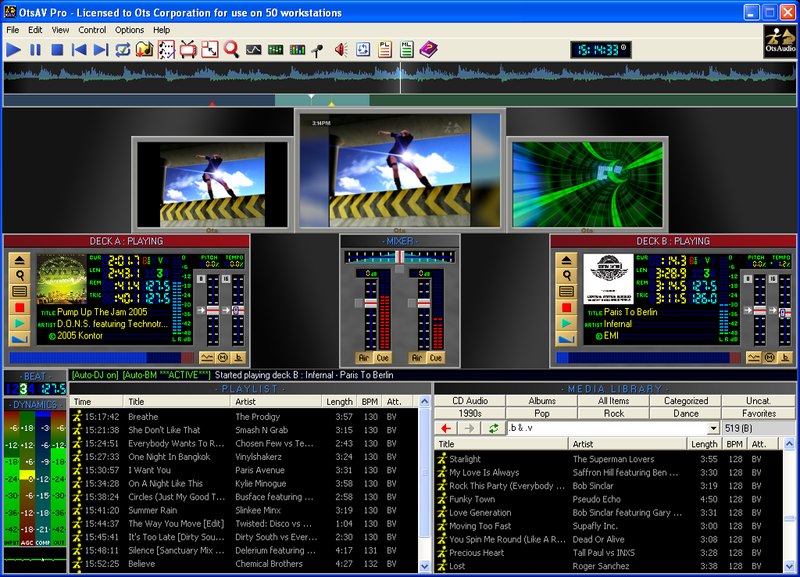 Mix and beat mix video content at broadcast quality (50/60 motion updates, locked and stable), and present karaoke CD+G content. Run your own MTV-style music channel with smooth titling, mixing and ticker! OtsAV Free features amazing time-scaling quality with a range of +/-100% (right down to stationary and up to double-speed). Many other features include volume management, manual override, powerful media library system, instant response controls, remote access control server, tempo/pitch/direction deck controls, scratching, and hourly clock scheduling. With the Pro edition you can also output to WAV, webcast with shoutcast, cue, and more. Version 1.77.001 delivers Vista support (32-bit) and all-in-one Audio, Video, Karaoke and Scheduling integration under the new OtsAV name.